PAULINE BAKES THE CAKE! : Tim's Little Boy Blue With Bunnies! Tim's Little Boy Blue With Bunnies! Commissioned by William and Shen for their little boy Tim's first birthday. 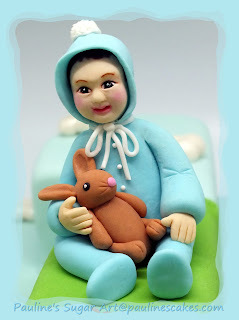 Tim was born in the Chinese zodiac year of the rabbit so some bunnies were featured on the "Little Boy Blue" figurine and on the cake. Happy Little Boy Tim...His face was hand modeled from a pic courtesy of his parents, William and Shen. One year old Tim is a cutie with a very happy smile that crinkled up his eyes. My challenge was to capture his facial expression. Out From The Sewers... Here Comes Spiderman! Ananya's Sweet Little Princess In Pink! News Flash! Mischievous Baby Topples Cake!